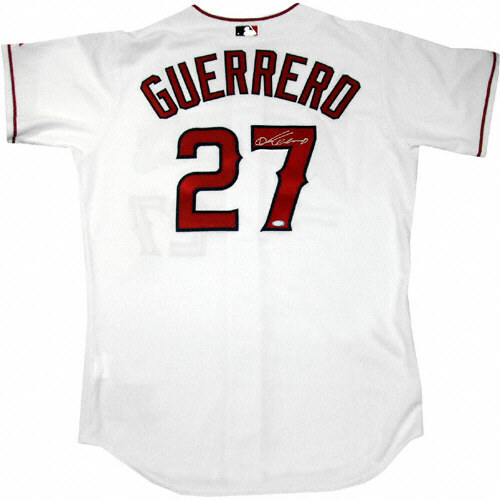 A feared hitter throughout much of his 16-year MLB career, Vladimir Guerrero cards and autographed memorabilia remain collectible even into his retirement. 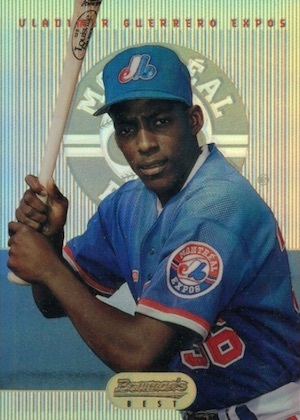 Besides being one of the greatest Montreal Expos ever, Guerrero was nine-time All-Star and American League MVP award winner. He was inducted into the Baseball Hall of Fame in 2018. Guerrero has just two rookie cards, 1995 Bowman and 1995 Bowman's Best Baseball. In addition to his base rookie card in Bowman's Best, he also has a Refractor parallel. Guerrero also has popular minor league cards 1995 SP Top Prospects and 1995 Upper Deck Minors. 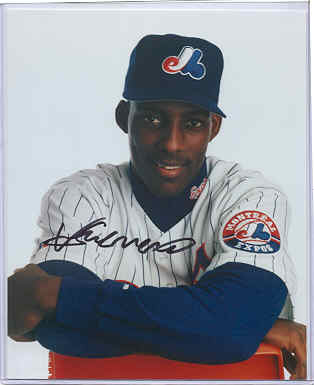 The first MLB Vladimir Guerrero autograph cards can be found in a few different 1997 products. Among them are three different ink versions in 1997 Bowman Baseball. 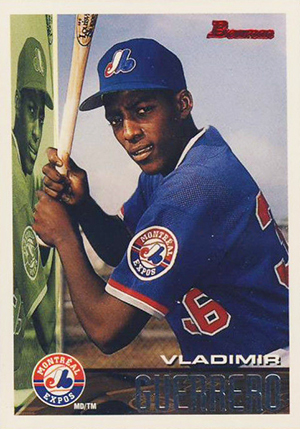 See also: Top Vladimir Guerrero Baseball Cards. Vladimir Guerrero's first game-used memorabilia cards were produced in 1999 by Upper Deck. He has a Winning Materials dual bat-jersey card in 1999 SPx, a game-used cap card in 1999 Upper Deck Encore and a bat card in 1999 Upper Deck Ovation. 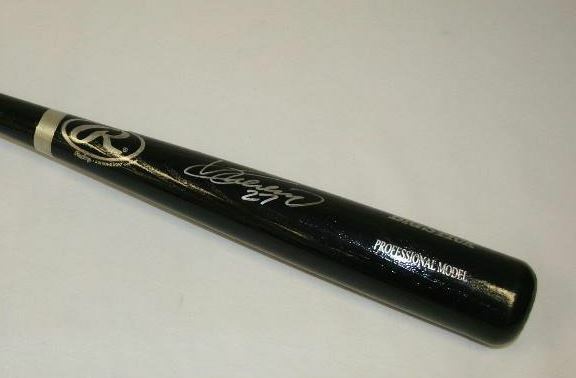 Guerrero's autographed memorabilia, particularly bats, are also highly collectible. He has not participated in many public signings but was a willing in-person and through-the-mail signer during his career. The design of the 1995 Bowman set was a definite upgrade from that of previous year's. The cards feature full-bleed photographs and foil accents that give the cards a premium feel. Guerrero is now the most valuable card in the set. The chromium card stock used in Bowman's Best provides an ultra-premium feel to the set. During Guerrero's peak, this was one of the most popular cards in the entire hobby, particularly the Refractor parallel. Again, Vlad is the key card in the set. VLADIMIR GUERRERO SR. 1995 BOWMAN CHROME ROOKIE CARD #90. SUPER MINT CONDITION. 1996 BEST VLADIMIR GUERRERO MINOR LEAGUE PSA 10 GEM MINT !! 1996 BEST VLADIMIR GUERRERO MINOR LEAGUE CAPITOL 10 GEM MINT !! 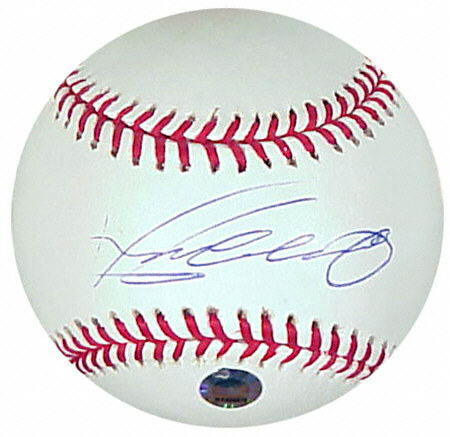 Below you will find an example of what Vladimir Guerrero's authentic signature looks like. This can be used as a first point of reference for determining the legitimacy of autograph memorabilia, but is not a substitute for having your items authenticated by a well-respected professional autograph authentication company. Some of the trusted sources within the sports memorabilia market include the following companies: PSA, JSA, Steiner, Mounted Memories and Tristar. Click on any of the images below to view full size photos. The signature typically consists of the initial "V" and his last name in full. The "V" starts with a very small hook on the left line and the right line finishes with a longer flair. Each letter of the last name is clearly discernible. The signature finishes with a line coming of the "o" that comes up above and back across the signature to the left. It typically finishes near the "rr"s.
He often inscribes his jersey number.